Vacation rental villa. Sleeps 8, 4 bedrooms, 4 bathrooms. No pets allowed. 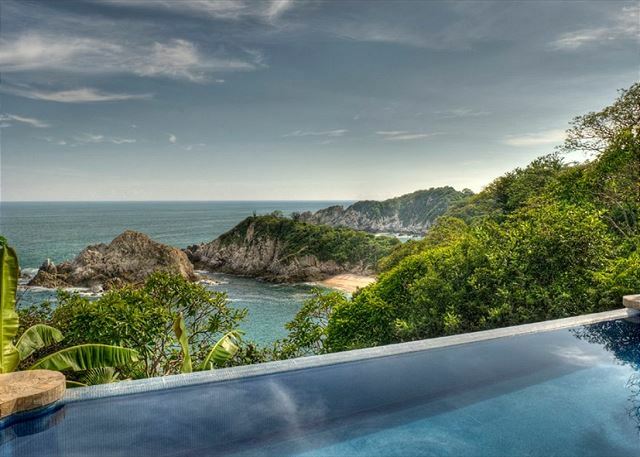 With stunning views, spacious rooms and a great location, Villa Diamante is truly a great vacation rental find, along the rocky coastline of Huatulco. Perfect for any occasion:a romantic wedding, a family reunion or simply a blissful tropical escape. 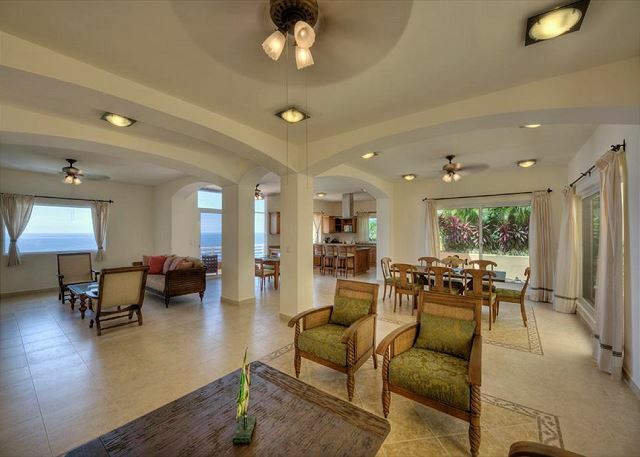 Nestled on a spectacular sloping lot overlooking a beautiful beach below, Villa Diamante offers 4 bedroom suites, 4 baths & comfortably sleeps 8 adults + 2 children. Finding a private spot to enjoy some R & R is no challenge in this sprawling cliffside estate. 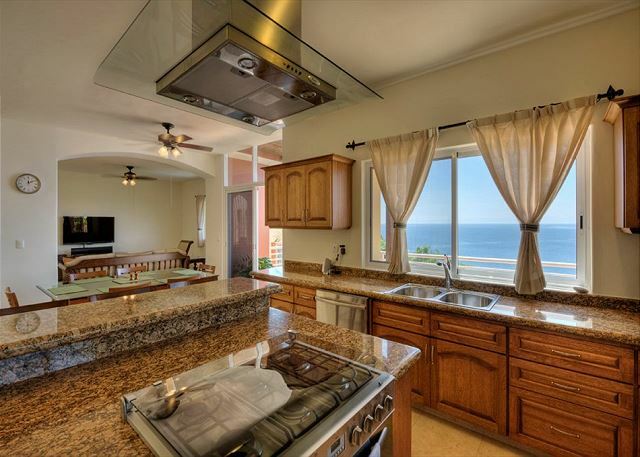 The two spacious master suites each offer full en suite baths and private oceanfront terraces. The 2 guest suites each include private en suite baths and share an oversized oceanfront terrace, spanning the length of the villa. There is a fifth room, located on the bottom floor of the home, offers an area for additional sleeping space to accommodate extra guests/children. The home also features a large, open, fully-equipped kitchen with granite counters and high-end appliances plus formal and informal dining rooms that can accommodate 12. The home also features both formal and informal living rooms plus two sunrooms, one of which can be converted to an extra bedroom (as noted above). Maid service Monday - Saturday is included with the rental. If you wish to have prepared meals, planned excursions, private massage, or anything else we will be happy to assist with the arrangements. 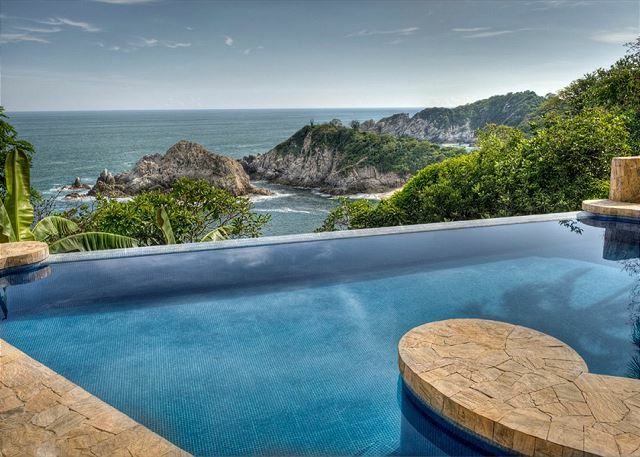 By reserving this villa through My Huatulco Vacation, you can take advantage of the many services we offer - including coordination of airport transfers, pre-arrival pantry stocking, private chef service, itinerary planning, and more. 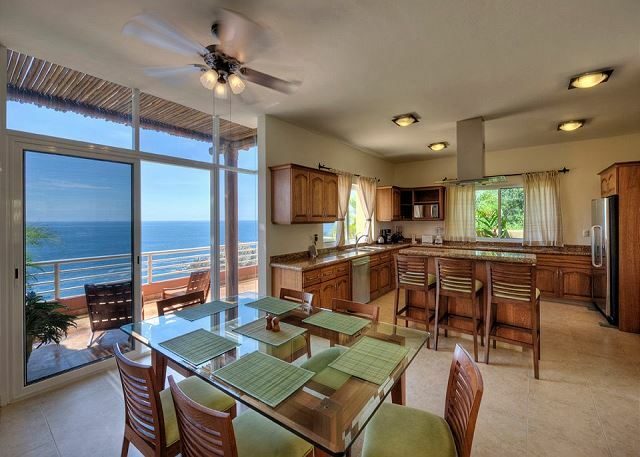 Our team can offer any details on both the property and the region to assist you in setting up a dream vacation with everything you need to make the most of your time in the area. This was our first stay at Villa Diamante and we loved it. The views were incredible and the villa was exactly as described. This villa is very private which allowed us to thoroughly enjoy our vacation . 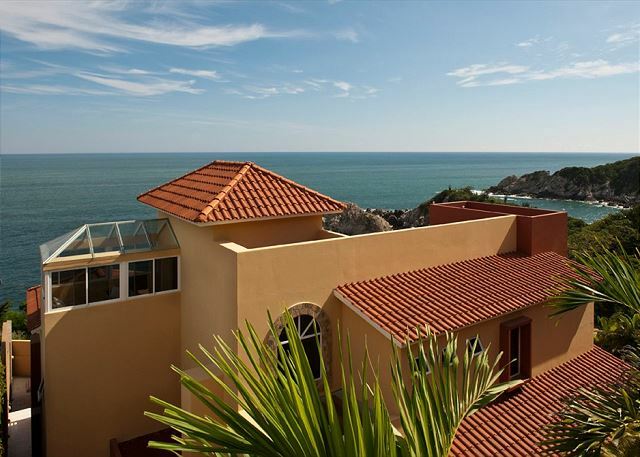 The staff at MY Huatulco Vacation are amazing and very helpful in choosing properties that fit your needs. Dear Kim, Thank you for sharing your experience at Villa Diamante. I am truly happy to know that Kerri Wrixon from our Reservation Team oriented you to this amazing Villa. I am very happy to know that it suited you perfectly and was the right choice for you and your party. Looking forward to see you next year! Regards, Cathy Bergamo & Your Friends at My Huatulco Vacation. We loved the villa and Huatuco. The Villa is amazing! The service provided was excellent. Our daily maid service and pool care was much appreciated. We did feel that the bedding, pillows and towels needed updating. They were worn and tired looking. For a villa of this caliber - bedding etc should be new. The furniture could also use updating. Thank you so much Marnie to take the time to share your experience at Villa Diamante. 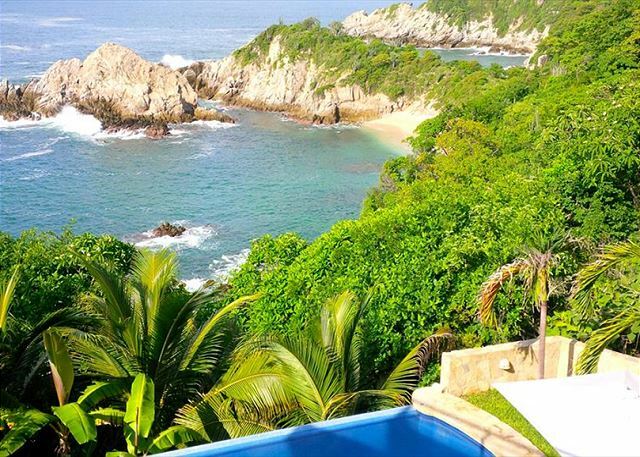 I am truly happy to know that you fell in love with Huatulco and enjoyed very much your stay at the property. Thank you for highlighting Eli's cleaning service, she is always very attentive to the guests needs. I would like to advise you that we passed along your comments regarding the linens in general to the property management team and to the owner. It is thanks to feedback like yours that we are able to offer this type of insight to our property owners so they can support us in maintaining the highest standards and quality for the properties in our rental inventory. We hope to have the opportunity to host you and your group again in Huatulco. Sincerely, Cathy Bergamo & Your Friends at My Huatulco Vacation. We had a fantastic time in Huatulco. It is a beautiful, well maintained and friendly town. The house is a short taxi ride to town, no car rental needed. The walk up to the street is a bit of a workout in the heat and the nearest beach also requires uphill walking home but only 15 min away. The pool is a wonderful way to spend the evening after a day on the beach. We would definitely stay again. Beautiful home in a convenient location and within minutes to nearest town. We all enjoyed the ocean view and infinity pool overlooking the Pacific Ocean. House was impeccable with beautiful layout and each of us had our own bedroom with private bath. Staff was cordial and very professional and security added to our peace of mind during the day when we were out and at nighttime. The nearby beach is not accessible from the home and appears part of a near condo complex. The one negative is the music from the beach can echo off the rocks and seems to be a constant reminder that the private beach/music can be sometimes annoying. We enjoyed visiting La Bocana Beach and made a trek to a local surf spot which was pretty remarkable and pristine. We chartered a boat to snorkel/fish and managed to make our way to St. Augustine Beach and the National Park. We observed dolphins, Whales, Manta Rays and Sea turtles along the way...and the fishing yielded 3 Bonita which we all enjoyed grilling/eating for supper that night. One night we made dinner reservations at the Ocean Restaurant in the Cosmos complex which was superb in quality and presentation. The house had a myriad of bird life that passes through the area and one day we even had an iguana that was sunning itself on the driveway up from the house. We all had an enjoyable visit and spending some quality family time together in a most beautiful spot. The only thing negative was when we looked at website it said we would have beach access with a path to the beach, but there wasn't. Also you should let people know that the drive down to villa is not accessible by a large vehicle such as van or suv. Other than that our vacation was great. Hi Jannett, Thank you for taking the time to review your experience at the property and I am glad to see that you gave it 5-Stars across the board! Regarding the beach access, THANK YOU, I want to confirm that this discrepancy was corrected by our team as soon as the issue was brought to our attention. In short, though the listing on our website accurately outlined the walk-time to the beach and the fact that it was not direct access; there was also a secondary piece of outdated/conflicting information from years past. Unfortunately this was missed by our marketing team when the listing was updated but has since been addressed! With that said, I regret that the topic didn't come up during the booking process as I have stayed at this villa a number of times and would have been able to quickly flag the correction. This is a phenomenal home that is very popular among our guests, so I am extremely happy to know that it delivered a 5-Star experience for your group overall. Looking forward to hopefully having an opportunity to host you and your group again in the future! All the best, Kerri and your friends at My Huatulco Vacation! Great time at Villa Diamante! This Villa was absolutely amazing! Maid service daily, gated villa. The concrete path down to the villa is very steep, so going up and down is a bit challenging. The cabs will drive up and down though to pick you up. Its quite far to walk into Santa Cruz, especially in the heat. There is a public beach in Arrocito that is awesome though, with great food and drinks. You can snorkel there as well. The ad did say access to a private beach which we did not have. No biggy, but it was in the ad so we kind of expected it. Overall the trip to this Villa was amazing, and highly recommended! We came to this beautiful house on a family trip and it is wonderful. The house is in a convenient location, very clean and spacious. The infinity pool overlooking the bay is amazing. The staff at My Huatulco was really helpful and spent a lot of time to find the right fit for us. Thank you! Dear Heidi, Thank you very much for taking the time to write this review, we are very pleased that you had a great stay at the Villa and you could enjoyed a quality time with your family. We will be happy to have the opportunity to host you again in the future. Sincerely, Cathy Bergamo & Your Friends at My Huatulco Vacation. This large house is well maintained and was constructed with premium materials. Everything worked well and it has a secluded feel to it because it is situated halfway down hill/cliff. The driveway is impressive and memorable. The house is multi level so there a lot of stairs. The pool is two levels down from the living room/kitchen, but it has easy access to a grill area and bathroom. Beautiful view and lovely Villa - good for the whole family! The Villa looks just like it does in the picture. The view really is that great. We were a family of 10 and this Villa was perfect. It was clean and had lots of space. For a large Villa a few extra chairs around the pool or outside table, on the decks would be nice. The driveway is on a very step hill so you will need to be able to manage that.